We've been cooking like crazy this week. I think I'm averaging about three dishwasher loads a day between all the cooks in this house. 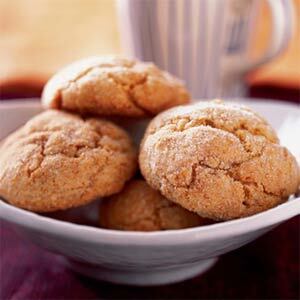 One of our favorite recipes this week was this one for Chewy Ginger Cookies. They are like a moist molasses ginger snap and we just had to share. In a large bowl, cream together the margarine and 1 cup sugar until light and fluffy. Stir in the molasses. Mix the water and baking soda and stir. Sift together the flour, salt, and dry spices; add gradually to the sugar-margarine mixture. Gradually stir the sifted ingredients, along with the ginger and raisins, into the molasses mixture. Shape dough into walnut sized balls, and roll them in the remaining 2 tablespoons of sugar. (The dough may be too soft to handle at this point- I suggest either adding a bit of flour, or refrigerating for 20 minutes[or even overnight]). Place the cookies 2 inches apart onto an ungreased cookie sheet, and flatten slightly. Bake at 350°F for 10-12 minutes. Do you have a recipe you'd like to share? Please link directly to your post, not your homepage, and please include link back here to the Grocery Cart Challenge. Hubs LOVES ginger cookies! Thanks! Man, I wish we could only spend $60 a week on groceries! With food sensitivities, I think it's impossible for us though.